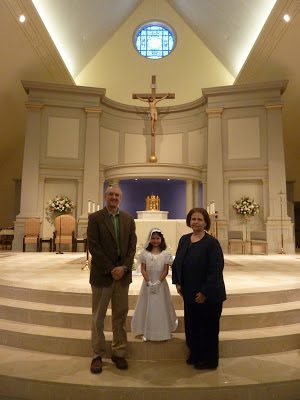 On Saturday, Cecilia received her First Holy Communion. It was a beautiful spring day and she looked absolutely beautiful. 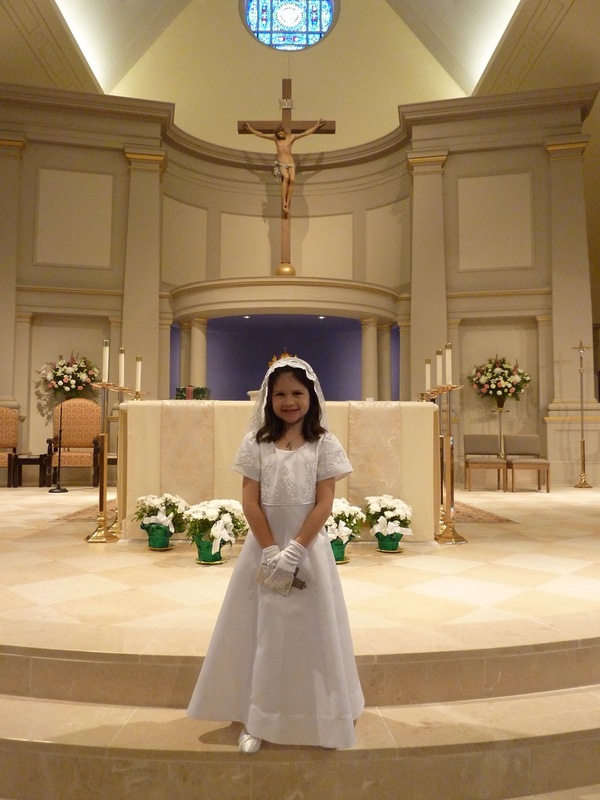 She wore her white chapel veil that I bought from Lily. 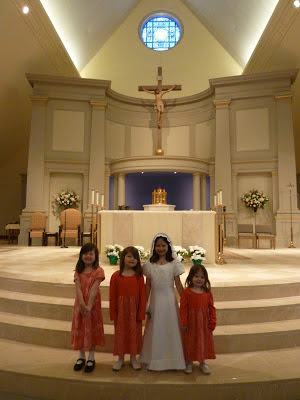 Finding a dress was difficult since most chain stores don't carry them anymore or only carry a few that we found too short, too sleeveless or too otherwise inappropriate for a little girl. We found this beautiful dress at Christian Expressions' website. They had a wonderfully large selection of dresses that didn't cost an arm and a leg. We also got her gloves from their website. Shoes were another ordeal but those were from a website as well. I can understand why many parents are turning to bridal shops to buy First Holy Communion attire. Without the internet, good selection is just very hard to come by. 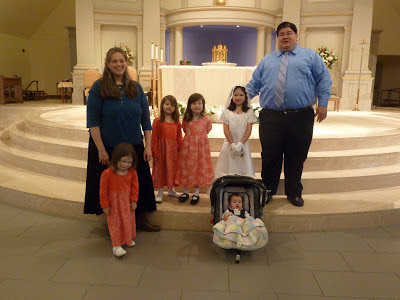 Not surprisingly, Teresa was a bit of a handful during the Mass and James spent most of the Mass in the back with a very squirmy 2 year old. The other girls were quite good though. Cecilia was impeccable. She sat still and quiet. She listened. She prayed. She got up when she was supposed to to bring up the gifts - she carried a candle, an absolutely huge candle they let us take home too. Each communicant sat with their parents and siblings and anyone else you could squeeze into their assigned pew. 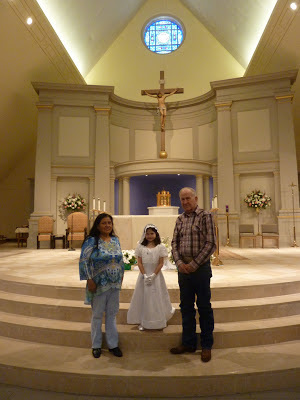 Fortunately, we had a big one, so we also fit both pairs of grandparents. When it was her turn to receive, she processed up and her sisters, parents and 4 grandparents encircled her as she received. 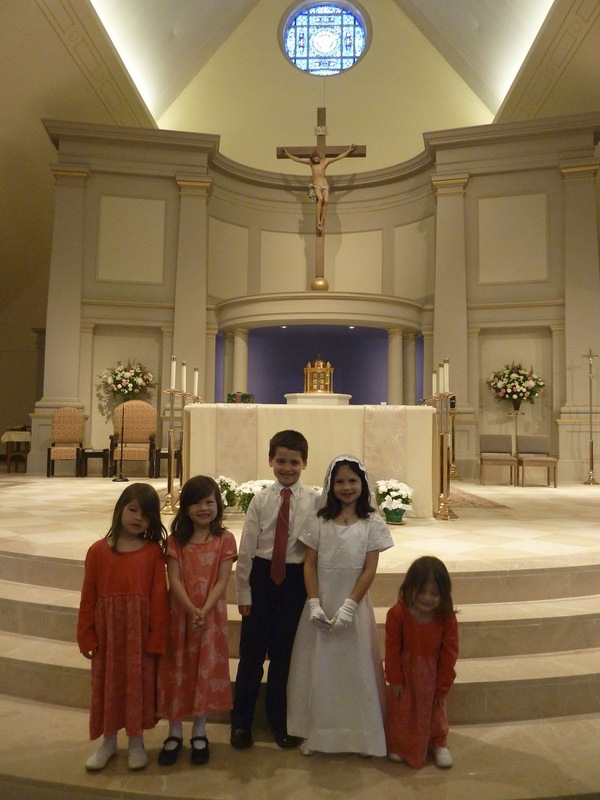 Then we received and all returned to our pew. It was quite lovely and beautiful. Cecilia insisted on getting a picture with one of her best friends, whose First Holy Communion we celebrated last weekend. Also in attendance were Cecilia's great grandparents, godparents, uncle, great uncle, great aunt, second cousin and numerous friends. We had quite a few kids that afternoon and they had a wonderful time playing inside, outside and everywhere in between. 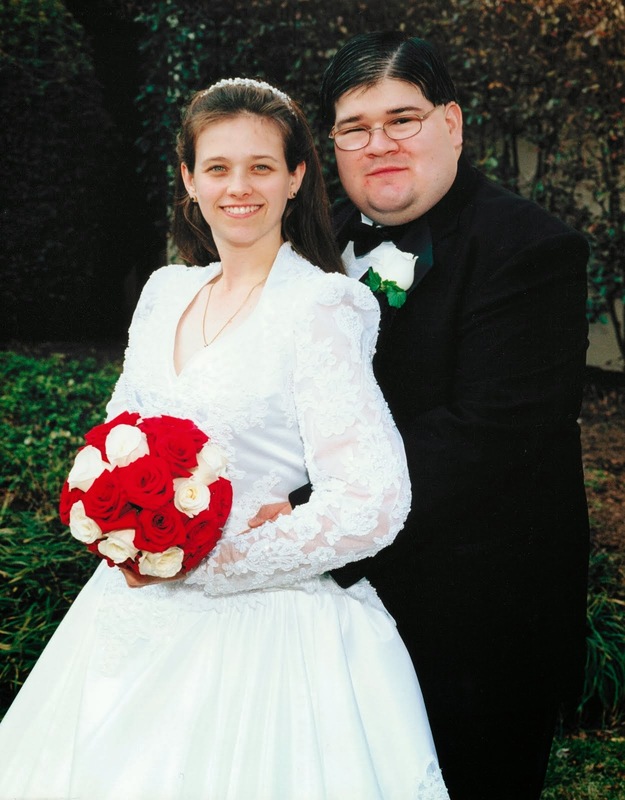 We had Chick Fil-A nuggets, fries and wraps, platters of fruit, cheese and veggies, sandwiches, stuffed shells, meatballs, shrimp, and, of course, cake. We have found a wonderful local bakery that makes the most delicious cakes and they came through as always. Cecilia received a beautiful crucifix, miraculous medal, music box, rosary, photo album, prayer cards, communion necklace, communion stuffed bear, commemorative books and more. Each of the First Communicants made a quilt square that was then sewn into one quilt. 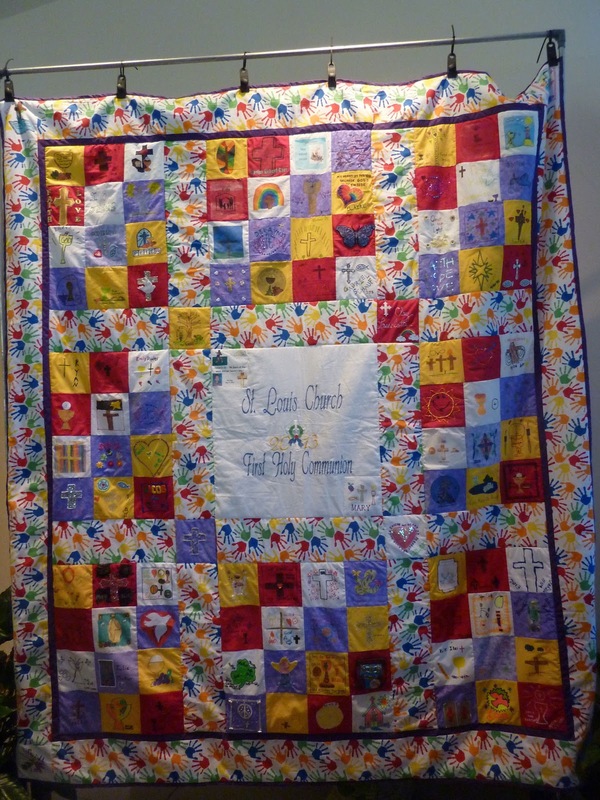 Then raffle tickets were sent to the families of the communicants and, for a small donation, you could buy tickets try to win the quilt, the money going to our sister parish in Haiti. When I filled out our raffle tickets, I thought it would be nice if all of us were represented, so I filled at least one ticket out with each name of a member of the family. So we were all quite shocked when, during our celebration party, the phone rang and a lady asked to speak with my 2 year old. The poor lady on the other end of the line didn't understand why my mom was so confused and hesitant to hand over the phone to Teresa, so she explained why she was calling. Teresa won the quilt! It is an absolutely beautiful quilt and it is quite large... it is about 6' by 8', so I'm not completely sure where it will go yet, but Cecilia is absolutely thrilled to have it. I was too busy during the party to take pictures beyond my obligatory photo of the cake, but it was a wonderfully, blessed day and we are so very proud of and happy for Cecilia. I love that she has the quilt; what a sweet memory! 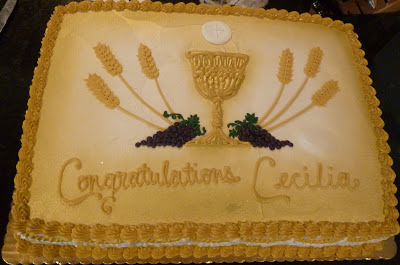 Congratulations to Cecilia, and you all! YAY! 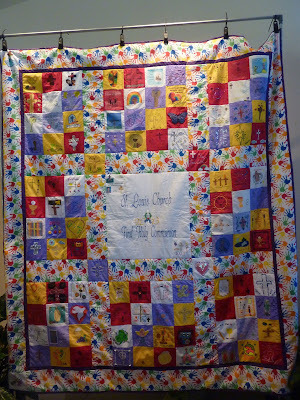 Congrats on the quilt - it is such a nice idea! And she looked absolutely beautiful! Bless her little heart - you guys have done such a wonderful job with your children... no doubt Felicity will put aside ideas of rainbow party hats soon enough, just like you said. Ha ha!